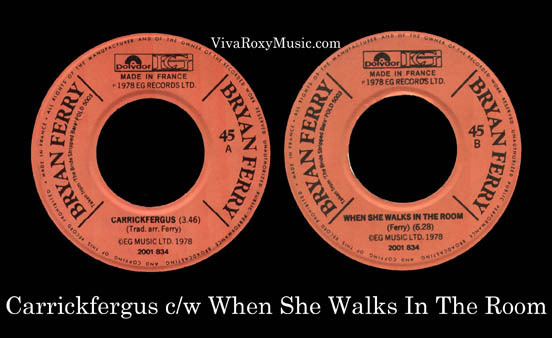 Lyrics to the song Carrickfergus as recorded by Bryan Ferry. Carrickfergus is a traditional Irish Ballad which has been sung by many artists including Van Morrison and The Chieftans. The song was first performed live by Bryan Ferry as a 'one off' after the Royal Dublin Showground show 13th December 1988 accompanied by The Edge from U2. The song was released as a single in 1978 but didn't enter the top 100. It was performed as a duet with Audrey Wheeler during the Bryan's 1994/5 tour and was also part of the 1999 As time Goes By tour & Frantic Tour 2002-03.